Among Protestants the word 'reformer' will call to mind one specific group of individuals operating either in close or distant orbit around Martin Luther. But the fact is, Luther was not the first to try to reform the Catholic church. Time and time again the church became corrupt over the centuries and each time God raised up individuals to address the abuses. Two such men were Robert of Molesne and Stephen Harding. By the end of the church's first millennium monastic orders had become one of the driving forces in church life, and to be fair, the system worked well, most of the time. Contrary to popular belief the monasteries were not places where the religious holed-up and ignored the world. From within the monastery walls they reached out to meet the needs of the surrounding community. They provided education, medical services, emergency relief in times of flood and famine; they served as arbiters negotiating disputes and generally served the needs of the people in the name of Christian charity. The walls of the monastery were intended to protect the religious not from the common man, but from the all too common temptations that ruled the world at large. There is, of course, one drawback to this plan. The religious communities, like the world around them, were made up of people. And people are easily led astray, even by the best of intentions. The problem was that as the monastic community did what they did so well, people began to reward them with various gifts, money being high on the list. Eventually civil authorities often just let them run things. As more and more responsibility was entrusted to them the religious orders become more influential in governing circles. With influence comes power and power, as they say, corrupts. The orders became wealthy and embroiled in the world's value system. Robert and Stephen looked at the way things were and determined that the older orders were no longer following the example of Christ. Had not Jesus lived a life of poverty? Had not his disciples left all to follow him? Furthermore, Jesus had called the rich ruler to leave all to follow him and had taught that it was hard for the wealthy to enter the kingdom of heaven. After unsuccessful attempts to turn the hearts of the corrupt, the two men, along with some like minded fellows, sought to escape the soul-sapping temptations of wealth and power, by organizing a monastery of their own at Citeaux in Burgundy. Their new monastic order, the Cistercians or "white monks" dedicated themselves to silence, austerity and manual work rather than scholarship. Intent on resisting the lure of the world, they refused to accept tithes, gifts, or lay patrons, seeking a plain, simple lifestyle without treasures or personal possessions. Unlike other orders where the bulk of the work was done by hired lay-people, they kept no servants, believing that work itself was a form of prayer. When not engaging in tasks such as farming, cooking, weaving and carpentry, their day was devoted to meditation, reading, and divine service. They allowed themselves seven hours of sleep in winter and six in summer. In summer they ate once a day; in winter, twice. 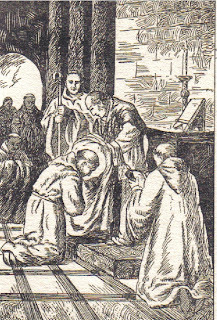 The order kept pretty much to themselves, as was intended, until, fourteen years after their founding one Bernard of Clairvaux would arrive at Citeaux (see woodcut at right). It was Bernard that realized the potential of what Robert and Stephen had started. He took their simple rules for monastic life and started another Cistercian monastery in his hometown. In the years to follow he would found an additional 65 monasteries throughout Europe laying the foundation for what would eventually prove to be one of the great revolutions in European civilization. By the year 1300 there would be over 600 Cistercian monasteries and nunneries in existence. Their work ethic and their devotion to improving the lives of the people they served would lead to improved cattle breeds and the developments of several new methods of agriculture, which they eagerly taught to the farmers. The result was the transformation of the wastelands of Europe into highly productive farmland. The efforts of the Cistercians left Europe far better off than they had found it. Other orders began to follow their example and the life of the common man gradually improved. They still faced hard times, by our standards, but for the 14th century farming life had never been better. Life was also good for the Cistercians. Their influence grew with their contributions to society and that made them a very wealthy and powerful order. The administration of the order and its activities across the continent soon occupied more and more of the monks time. They withdrew from manual labour, leaving it to the hired lay-brothers that became associated with their monasteries. It was not long before allegations of greed and corruption were made, as they themselves had accused the older orders that had motivated their founding. The cycle continued, even as it does today. The opening of the first Cistercians monastery at Citeaux by Robert of Molesne and Stephen Harding happened on March 21, 1098 - 910 years ago this week. 1. Gildas, F. M. "Cistercians." The Catholic Encyclopedia. New York: Robert Appleton, 1914. 2. Various encyclopedia articles, histories, histories of Christianity and internet articles. March 15, 1517: Pope Leo X issues the infamous indulgence that would ultimately lead to the Reformation and the Protestant movement. Having drained the papal treasury indulging his love of lavious living and entertainment, Leo needed to raise funds to rebuild St. Peter's basilica. In exchange for donations he offered "to absolve you ...from all thy sins, transgressions, and excesses, how enormous soever they be...and remit to you all punishment which you deserve in purgatory on their account and I restore you...to the innocence and purity which you possessed at baptism; so that when you die the gates of punishment shall be shut... and if you shall not die at present, this grace shall remain in full force when you are at the point of death." March 16, 1649 : Jesuit missionaries John of Brebeuf and Gabriel Lalemant are martyred in Quebec, Canada. When a tribal war broke out between the Iroquois and the Hurons they had been instructing in the Christian faith, the two men refused to leave their charges despite the warnings of the Huron chief. When the Hurons were over whelmed and slaughtered by the Iroquois the Jesuits were tortured to death over a two day period. March 17, 1780: Thomas Chalmers, pastor and reformer is born. In 1843, angered by the restrictions and controls imposed on the Scottish clergy by the state, Chalmers led a third of the Scottish clergy and a half of the laity out of the church of Scotland and into the Free Church of Scotland (FCS), which he helped to found. March 18, 1861: London's Metropolitan Tabernacle, the sanctuary of English Baptist preacher Charles Haddon Spurgeon, opens. Spurgeon had insisted that the enormous building employ Greek architecture because the New Testament was written in Greek—a decision that influenced church architecture throughout the world. March 19, 1229: After negotiating a treaty with Muslims for Christian access to Jerusalem, Holy Roman Emperor Frederick II (coerced into participating in the sixth crusade by the pope) enters the Church of the Holy Sepulcher and crowns himself king. Unfortunately his peace treaty was denounced by members of both faiths, and Frederick was later excommunicated for making peace instead of war. Go figure! March 20, 1852: Abolitionist Harriet Beecher Stowe, daughter of famous Congregational minister Lyman Beecher, publishes Uncle Tom's Cabin (which had been serialized in an antislavery newspaper). The book sold one million copies and was so influential in arousing antislavery sentiment that Abraham Lincoln is reputed to have said upon meeting Stowe in 1863: "So you're the little woman who wrote the book that made this great war!"